Bishop Mason was incarcerated in 1918 in the jail cell in the Holmes County Courthouse. He was falsely accused of treason by those opposed to his Holiness message. The jail cell is now a pilgrimage site, open to the public and decorated with hand-painted murals depicting his incarceration. Dr. Byron Klaus, retired president of the Assemblies of God Theological Seminary (1999-2015), was a keynote speaker at the dedication of a State Historical Marker honoring the birthplace of the Church of God in Christ. The event, held in Lexington, Mississippi, on October 16, 2015, evidenced the deepening relationship between the Assemblies of God and the Church of God in Christ. While the Church of God in Christ is the largest predominantly black Pentecostal denomination in the United States, its roots are often overlooked. Few people noticed when Charles H. Mason founded a small Holiness church in 1897 in Lexington. Rejected by his fellow African-American Baptists on account of his Holiness teachings, he represented a marginalized religious group within a marginalized race. But his teachings caught fire among both African-Americans and whites, and his followers soon stretched far beyond the small Mississippi town. When Mason identified with the Pentecostal revival in 1907, he parted ways with ministry colleague Charles P. Jones and reorganized his followers as the Church of God in Christ (COGIC). Immediately, the COGIC became one of the largest and most-respected fellowships in the fledgling Pentecostal movement. Lexington’s role in COGIC history has been largely overshadowed by Memphis, home of COGIC international headquarters. Seeing this inequity, Mother Mary P. Patterson (widow of former Presiding Bishop J. O. Patterson, Sr.) launched a grassroots campaign to encourage COGIC members to rediscover their Lexington roots. Since 2006, Patterson has organized tours of the historic sites through her company, The Pentecostal Heritage Connection, and she built relationships with Lexington officials, church leaders, and historians. Patterson’s efforts culminated on October 16, 2015, when a State Historical Marker honoring the COGIC’s birthplace was dedicated at the south entrance of the Holmes County Courthouse in Lexington. The Mississippi Department of Archives and History approved the marker, and the Church of God in Christ Board of Bishops, chaired by Bishop John H. Sheard, sponsored and paid for the recognition. David Daniels, chairman of the COGIC Commission on Education, supported the project with historical documentation. The dedication ceremony, organized by Patterson, featured three keynote speakers: Byron Klaus; Superintendent William Deans, pastor of St. Paul Church of God in Christ, Lexington (the first COGIC congregation); and Dr. Percy Washington, pastor of Sweet Canaan Church of God in Christ, Lexington (the second COGIC congregation). Each speaker provided historical insight into Lexington’s significance in COGIC history. Byron Klaus noted that the marker’s location is “is a poignant reminder that following Jesus is not an easy path.” The Holmes County Courthouse, he explained, intersected with COGIC history several times. In 1897 Mason began preaching on the courthouse steps, and then moved services to private homes and an abandoned gin house. While in Lexington, he founded St. Paul Church of God in Christ, the world’s first COGIC congregation. Later, in 1918, Mason was incarcerated in the jail cell in the basement of the courthouse on trumped-up charges that he opposed American involvement in World War I. Other church leaders who opposed the Holiness message tried to sabotage Mason’s ministry by falsely accusing him of treason. The jail cell that once held Mason is now a pilgrimage site, open to the public and decorated with hand-painted murals depicting his incarceration. Lexington was also home to Saints Industrial and Literary School, established in 1918 by Sister Pinkie Duncan and Professor James Courts to train African-American children. Under Dr. Arenia Mallory, president of the school from 1926 to 1983, the school became known as Saint’s Academy and was a prominent K-12 school in the community. 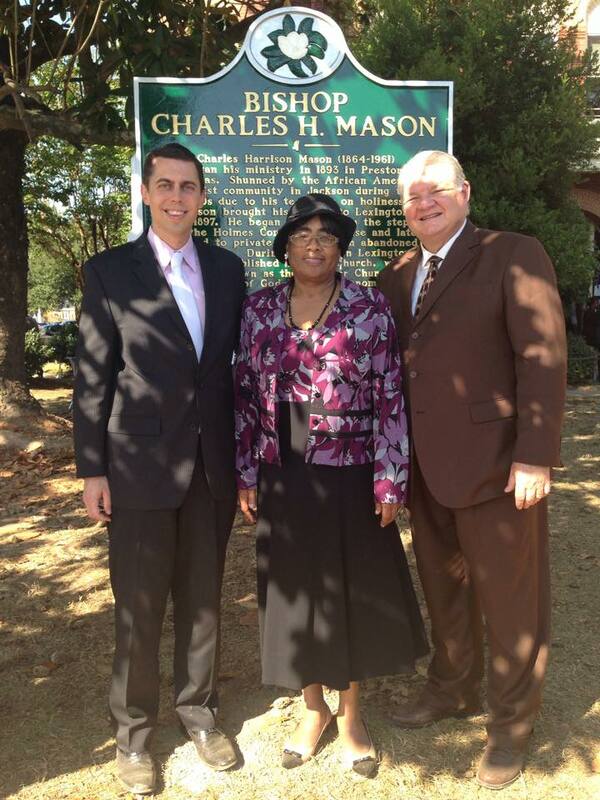 Dr. Mallory was a leading advocate for civil rights and the poor in Holmes County. The school closed in 2006. Mason, a bridge builder, was ahead of his time. He worked with both blacks and whites, striving to overcome the color barriers of his day. Klaus recounted that Mason gave his blessing in 1914 to the formation of the Assemblies of God. “I am forever grateful for that blessing from a father in the faith,” Klaus told the crowd. The heritage of the Church of God in Christ has much to teach the broader church. Its Lexington roots remind believers that great things often germinate from small beginnings, that the way of holiness is often marked by suffering, and that Pentecostalism emerged at the turn of the 20th century with an interracial impulse. These lessons come to life in Lexington, Mississippi. State Historical Marker dedicated on the south lawn of the Holmes County Courthouse, October 16, 2015. About 125 people attended the dedication. St. Paul Church of God in Christ, the oldest COGIC congregation in the world, was founded in Lexington in 1897. Bishop Mason began preaching in 1897 on these steps on the south end of the Holmes County Courthouse. Dr. Byron Klaus, standing in the original pulpit in St. Paul Church of God in Christ, Lexington, MS. Bishop Mason preached from this pulpit. One hundred years ago, the Assemblies of God ordained its first African American minister, Ellsworth S. Thomas of Binghamton, New York. Ellsworth was largely absent from the pages of the Pentecostal Evangel, other than a brief mention of his death, published 79 years ago this week. Recently uncovered information about Ellsworth sheds new light on this African American pioneer in the Assemblies of God. Ellsworth was part of a flourishing but small community of free blacks that existed in Binghamton in the nineteenth century. Historian Debra Adleman, who wrote about the black community in Binghamton, noted that many had escaped slavery, moved north, and formed a close-knit community. They overcame racism and societal restrictions, developed strong families, and carved out their own religious, economic, and social niche in the region. Ellsworth S. Thomas was born in 1866 in New York. His father, Samuel, was born in Maryland in 1830 and worked as a laborer. Samuel was also a Civil War veteran, serving for three years as a private in the Massachusetts 54th Infantry. Ellsworth was born about nine months after his father returned home from the war. Ellsworth’s mother, Mahala, was born in 1842 in Pennsylvania and worked as a laundress. Ellsworth was the eldest of two children born to the couple. After Samuel passed away in the early 1890s, Ellsworth lived with his mother and cared for her. Census records show that they owned a modest house and that most of their neighbors were white. He did not attend school, but he could read and write. Binghamton city directories from the 1890s reveal that Ellsworth was a laundryman. By 1900, though, they listed his occupation as a traveling evangelist. His name first appeared in the Assemblies of God ministers’ directory in October 1915, which stated that he was a “colored” pastor in Binghamton. He remained an active Assemblies of God minister for the remainder of his life. In 1917, the Assemblies of God asked existing ministers to re-submit applications for credentials, apparently because paperwork had not been kept during the earliest years of the Fellowship. Robert Brown, influential pastor of Glad Tidings Tabernacle in New York City, endorsed Ellsworth’s 1917 application. On the application, Ellsworth stated that he was originally ordained on December 7, 1913, by R. E. Erdman, pastor of a large congregation in Buffalo, New York. Correspondence in his ministerial file from reveals that Ellsworth also pastored a congregation in Beaver Meadows, New York. The Flower Pentecostal Heritage Center holds a 1936 letter from Paul Westendorf that informed the Pentecostal Evangel of Ellsworth’s death on June 12, 1936. He was 70 years old and passed away in Binghamton after a serious illness. Westendorf wrote, “He has been in the Council Fellowship for many years and so will be remembered throughout the Eastern District. Brother Thomas was faithful and true to the Lord in all kinds of circumstances, serving Him with gladness, therefore we feel that he had an abundant entrance in the presence of the Lord.” Ellsworth S. Thomas’ passing was briefly noted on page 13 of the July 25, 1936, issue of the Pentecostal Evangel. No photograph of Ellsworth S. Thomas has yet been located. Persons with additional information about the life and ministry of Ellsworth S. Thomas are encouraged to contact the Flower Pentecostal Heritage Center at archives@ag.org. As the Assemblies of God continues to become more ethnically diverse, it is increasingly important that its history books include stories from the varied backgrounds of believers. 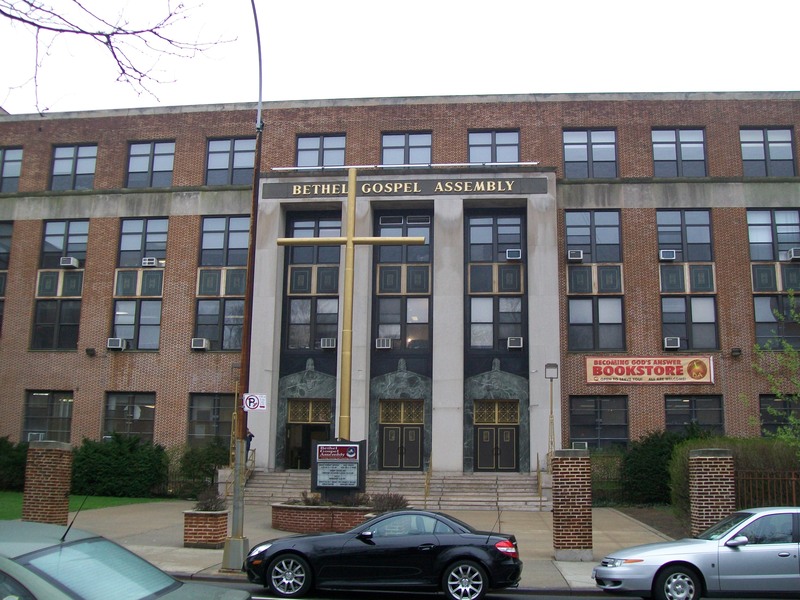 Bethel Gospel Assembly purchased the former James Fennimore Cooper Junior High School in Harlem in 1982. Lillian Kraeger (1884-1964), a young single German woman, demonstrated incredible courage and character when confronted with racism within her church in downtown New York City. Two young African-American girls, Mae Allison and another whose name is now lost to history, had accepted Christ in 1915 and applied for membership in Lillian’s church. They were rejected on account of their skin color. This broke Lillian’s heart. She did not want the young girls to fall away from the Lord. In January 1916, Lillian began traveling to Harlem, where the girls lived, and held “cottage meetings.” These home Bible studies blossomed and grew into a small congregation. Lillian’s commitment to her African-American congregation came at great personal cost. Her own family rejected her, as they did not approve of her crossing the racial barrier. Lillian had been engaged to a young man, but he called off the engagement because of her leadership of the mission. Lillian’s love for African-Americans caused her to be forsaken by her own people. Lillian was an unlikely missionary to African-Americans in Harlem. She did not have ministerial credentials, she was a single female in her early thirties, and she had accepted Christ just nine years earlier. In addition, her German heritage may have put her under suspicion because the United States was at war with Germany. The United States government carefully watched (and sometimes imprisoned) other white ministers who ministered among African-Americans during the First World War, suspecting them of crossing the racial lines in an effort to create an alliance with Germany or the Bolsheviks in Russia. In the Spring of 1917, a Pentecostal evangelist remembered as “Brother Jamison” shared the Pentecostal message with this small group of believers. Kraeger and several others in the congregation were baptized in the Holy Spirit. In November 1917, the congregation organized as Bethel Mission. Lillian felt a call to serve as a missionary to Africa. The Assemblies of God confirmed this calling and issued her credentials as a missionary in 1918. Lillian did not go to Africa, however, and remained as pastor of Bethel Mission. Her heart for missions became part of the DNA of the congregation. In 1924, Lillian established Bethel Missionary Home, a ministry that provided room and board for missionaries who had returned from overseas. In 1924 or 1925, James Barzey, one of the members of the church, was chosen to be succeed Lillian as pastor. Lillian retained her title as “Founder” of the church and put her energies into the development of the missionary home. The name of the home was changed in 1930 to Mizpah Missionary Home. Several years later Lillian married Assemblies of God missionary Alfred Blakeney, whose first wife had died. What happened to the small congregation founded by Lillian Kraeger? Bethel Mission, now known as Bethel Gospel Assembly, is led by Bishop Carlton Brown and ministers to over 1,500 people each week in Harlem. Bethel Gospel Assembly is one of the most prominent congregations in the United Pentecostal Council of the Assemblies of God (UPCAG). The UPCAG, a historic black Pentecostal fellowship organized in 1919, united with the Assemblies of God as a cooperative fellowship in February 2014. In a fitting turn of events, Bethel Gospel Assembly is honoring its roots and developing a deeper relationship with the Assemblies of God. It would have been easy for Lillian Kraeger to listen to her family and her fiancée and to forget about the two little African-American girls who had accepted Christ. But the courageous young German woman, despite great cost, followed God’s call. Almost 100 years later, Bethel Gospel Assembly has emerged to become a powerful voice within the African-American community in Harlem. Read Lillian Kraeger’s report published on page 8 in the August 26, 1933, issue of the Pentecostal Evangel. Skeptics and Scoffers: The Religious World Looks at Azusa Street, 1906-1907 (The Complete Azusa Street Library, Vol. 8), compiled and edited by Larry E. Martin. Pensacola, FL: Christian Life Books, 2004. Dr. Larry Martin has been my friend for many years and I have nothing but good things to say about him. We have been prayer partners, and one time we attended the Smithton Revival together. Another time Larry and I traveled to Indianapolis and Anderson, Indiana, tracing the footsteps of William J. Seymour and other early Pentecostals who sojourned there for awhile. Although now separated by distance, we have ongoing communication through emails and sharing of historical materials. The Life and Ministry of William J. Seymour: And a History of the Azusa Street Revival (The Complete Azusa Street Library, Vol. 1), by Larry Martin. Joplin, MO: Christian Life Books, 1999.